Our latest innovation comes as a part of our rotary tampon printing system. Our Rotoprint machine was first conceived due to the needs of clients who required compact construction with a high output of printed materials, all in on automatic system. Depending on the equipment required for each print job, the Rotoprint allows a maximum output of 180 printed bottle caps per hour with a 28 mm image. The Rotoprint can also be equipped for 1 to 3 colour printed images. 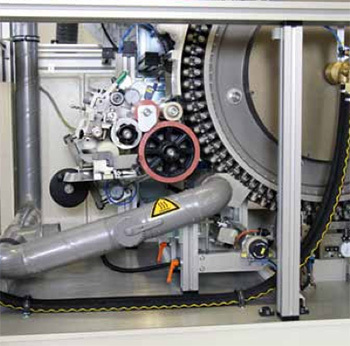 One of the latest technologies utilized by our Rotoprint machine is the “water-cooled wheel” option. In this process the “wheel” is warmed using gas flames at a pre-treatment station. The reason for this is that units that are partially drying, or are post-treated after the process can lead to many inaccuracies and possible feed problems. Even parts at room temperature can have a significant effect on print quality. By warming the wheel and then cooling it utilizing water, right on the line has provided our clients with the best results during the process. By creating the “water-cooled wheel” in our latest rotary printing machine, the H-RTI 21-150 ensures the highest print quality. The water feed and drain-off is done through the existing cooling circuit in your injection moulding machine or through an optional water cooler. The “water-cooled wheel” option can be selected for two-lane Rotoprint fully automated systems, and is standard on our three-lane Rotoprint fully automated systems. Since 2012 we have included the H-RTI 21-150 on all of our Rotoprint systems. Ensuring that our clients are always provided with the latest technologies in our industry. If you’re looking for more information on our latest developments in our rotary tampon printing technologies take a look at our latest newsletter, or give our office a call and our staff can instruct you on your companies needs.